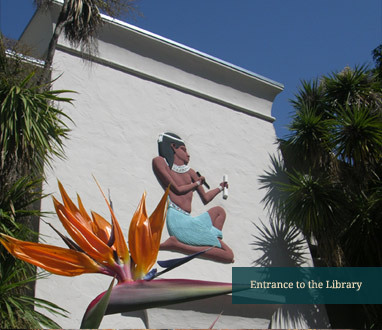 The collection of the Rosicrucian Research Library began in 1916. The current building, which is of Egyptian design, was constructed in 1939. Dedicated to the pursuit of Rosicrucian knowledge, the Rosicrucian Research Library contains a remarkable collection of books and other research materials on most esoteric subjects, as well as cultural, scientific, and other fascinating material. Rosicrucian members, visiting scholars, students, and interested members of the public are welcome to study here. The Rosicrucian Research Library's Rare Books Room features the Rosicrucian Manifestos of the early 1600s, first and early edition books by Jacob Boehme, Robert Fludd, Michael Maier, Francis Bacon, Isaac Newton, Louis-Claude de Saint-Martin, Papus, H. Spencer Lewis, and other authors important in the Rosicrucian and Martinist traditions. Click here to see images of some of the books on display in the Rare Books Room, with links to their text. The Library has opportunities for both members and friends who would like to volunteer to help in the growth and care of the collection. Please contact the Librarian for more information. "If one will begin with certainties, one will end in doubts; however if one were content to begin with doubts, one will end in certainties."